If I say “Irish cuisine” and your mind immediately goes to boiled, fried or over-baked fare, you’re doing yourself, and Ireland, a disservice. There’s a world of healthy Irish recipes to discover that are delicious and satisfying in their own right. Here are a few ideas that would be perfect to make on St. Patrick’s Day. On my must-try list is Irish colcannon ham and cabbage pie. Described by Irish Times as the “ideal rib-sticking pie you may require for dark autumn evenings,” the recipe combines Ireland’s classic colcannon, a dish of creamy mashed potatoes combined with steamed kale or cabbage, and in this case, with cooked ham. And we’re not talking about the deli slices here, we mean that nice, substantial stuff you’d find at a butcher’s shop. In this recipe, the cabbage gets steamed and “floury” potatoes get boiled and turned into a silky mash with the addition of butter and milk. The pie starts with butter and a sliced onion slowly pan-fried until caramelized, while in another pot, you make a simple roux out of butter and flour before adding some good quality stock. Season with salt, pepper and English mustard, add some cream for added flavor and then mix in the ham, caramelized onions and cabbage. Next, place the ham and cabbage mixture in a baking dish and top with your mashed potatoes. After 25 minutes in the oven, and you’ve got a hot, bubbly, delicious dinner. Think of it as your own Irish shepherd’s pie, if you will. 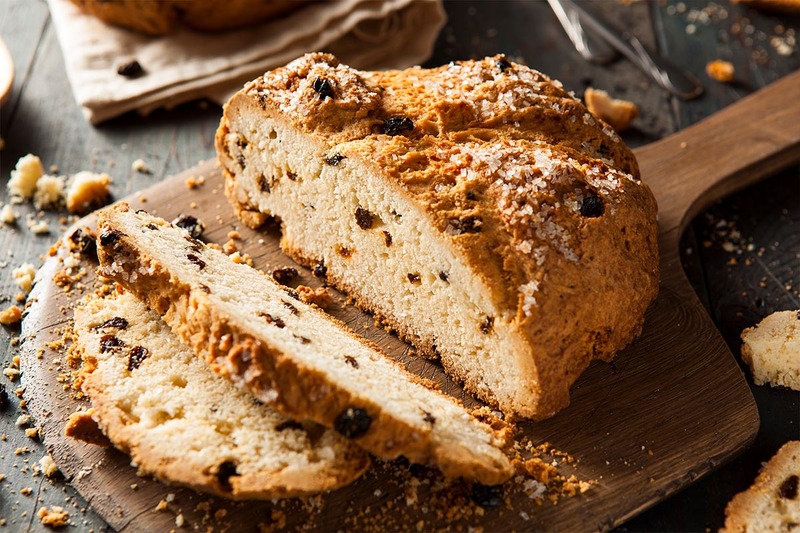 If your idea of good healthy Irish recipes for soda bread includes dried fruit and butter in the mix, then you, my friend, like the Irish-American version of the bread. According to Irish chef Rory O’Connell, the real deal is made with flour, bread soda, salt and buttermilk. That’s it! Today’s addition of sultana raisins or any dried fruit, said O’Connell in this interview with Epicurious, would have been “a luxury item” added to the white flour version of the bread as a treat during harvest time for the men who were working. Here’s a simple version of that raisin sweetened bread, this one with a heart-healthy addition of large-flake rolled oats and orange zest. It’s perfect for St. Patrick’s Day or anytime you please!